Editor’s note: Sklar Furnishing in Boca Raton has been awarded the 2014 Office Depot Leadership in Greener Purchasing Award – the only small business so recognized in Florida. A story featuring their work, “Cool Ideas for the Planet, and the Bottom Line,” which appeared earlier this summer in City & Shore, appears below. Other award winners this year included the City of Chicago, TD Bank, JM Family Enterprises, Memorial Sloan-Kettering Cancer Center, University of Michigan and the Miami Heat. White tents lined one side of the Sklar Furnishings parking lot in Boca Raton. Vendors promoted electric bicycles, organic wine and vegan food while vocalist Kendra Erika entertained the crowd. A Tesla electric car showed storage space was adequate under the hood and in the trunk because the engine, about the size of a watermelon, is mounted between the rear wheels. A Shred Trust employee was safely destroying documents for a $5 donation per container. Habitat for Humanity, the charity that helps fund homes for low-income people, was on site to educate people about recycling and to schedule pickups of furniture appliances, cabinets, lighting and other home goods. The real story behind this “All That’s Green” event, however, was inside Sklar’s 23,000-square-foot showroom where Yalmaz Siddiqui, senior director of Environmental Strategy for Office Depot, explained the cost savings of using LED lighting and showed a two minute video of how Sklar will save $240,000 in five years with eco-friendly LED lighting. The electric bill with the halogen bulbs was $6,300 a month; it is now $2,000 a month. That’s a savings of $51,600 a year. Although the LED bulbs are more expensive ($40-$50 each) as compared to $1 to $6 for the halogen, the LEDS get paid off in a short time period. Office Depot’s Siddiqui estimates a home with 60 bulbs might spend $2,300 on bulbs and save $24,000 in power bills in five years. 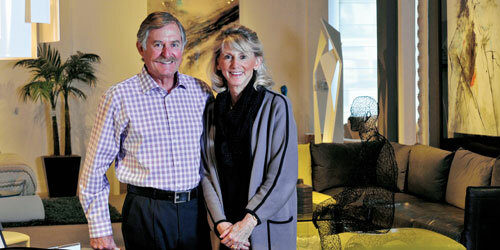 Sklar owners Rick and Pat Howard also live a green lifestyle. Originally from Canada, they have been recycling for years and are vegans that abstain from eating animal products. Rick, a member of Habitat for Humanity of South Palm Beach Chapter’s board, donated a percentage of sales from the event day to the charity. They also donate a tree to one of Florida’s natural forests for each purchase of a wood product.